Monday we woke to a pristine world, with about six inches of fluffy snow covering everything. Early in the day, it stuck to the trees, and buildings, but it soon melted as the sun came through the clouds, and good luck if you were out there without sunglasses. What a wonderful day for the end of February. It was sunny, bright, white, clean and very mild. I love this old choke cherry tree between Wheelhouse and Cedars cottage. The snow outlined its shape perfectly against the sky. In winter, these twisty branches provide perches for our bluejays and chickadees, ravens and woodpeckers. In summer, it is a profusion of green, a haven for birds, and as the fruit ripens on the tree into the autumn, it becomes a mecca. This is one of the best places to bird watch for the pileated woodpecker -- sitting in a chair on Wheelhouse's deck, with your feet up and a cup of tea in one hand, binoculars or camera in the other, and let the bird come to you! It's truly a beautiful tree for all seasons. Winter is just the season that best shows off the true shape of these lovely branches. Labels: choke cherry tree. pileated woodpeckers. Bondi Village Resort. Sunday was David's birthday. We had a lot to cram in. He opened gifts -- and at Nancy's house, he was ably assisted by two cats and the puppy. It was Taffy's first time removing gift wrap, so she was delighted to take part. The lads left the animals at home, and trekked down the lake to visit our friend Gord over at Beauview Resort, and to check out what was happening in the "greater world" down the lake. A.K.A. checking out the new cottage construction. Yikes! Of course, there was cake. Erika's Wild Flour Bakery in Dwight provided this tasty creation. Birthdays are a great excuse for a celebration, and for some family time. Not to mention a great excuse to spend a day out on the Algonquin Snowmobile Club trails, reportedly the best in Ontario! We're lucky to live here! 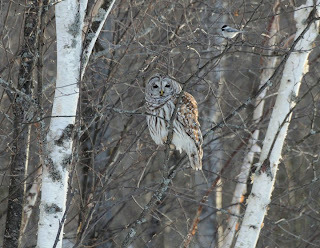 Last weekend we had Bill and his group of Nature Enthusiasts here. These folks really know how to enjoy the winter! On Saturday, most of them headed over to check out the ski trails at the Leslie Frost Centre. There are some great trails over there, just a few minutes away from our own. 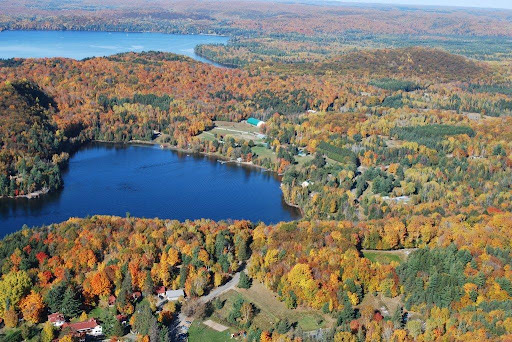 We really are spoiled for choice up here, with Algonquin Park just around the corner, and Arrowhead Park at Huntsville with it's own set of world class trails. Brian works hard on our trails, keeping them groomed, and his efforts are appreciated by our guests. Sunday, the group swapped skis for snowshoes, and headed out onto Bondi's 600 acres. The going was lovely -- we'd had a few inches of fresh snow dust down upon us, on top of a solid base. Not very cold, it was ideal weather to be tromping about, and the group took full advantage! Labels: Bondi Village Resort.Algonquin Park. Arrowhead park. Leslie Frost Centre. Muskoka. Lake of Bays. Snowshoeing. How small was that bear in the tree up Limberlost way? 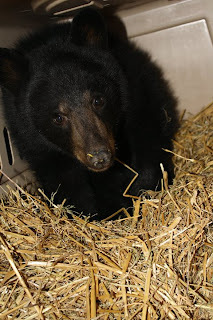 Well, here's a shot of Billie Bear in the dog crate she borrowed to travel to the Aspdin Valley Wildlife Sanctuary. CBC recently ran a really interesting piece on bears and how they hibernate -- a study at the University of Alaska took a serious look at hibernating bears. The bears were what is termed 'nuisance bears', which simply mean they were where people don't want to see them, usually in garbage bins or backyards checking out birdfeeders. Nuisance bears, created by people being careless with food, are dangerous, and as the old adage goes, To feed a bear is to kill a bear. They are frequently shot. Five of them in Alaska, however, got lucky. The bears were trapped, taken to the University, and outfitted for the study on hibernation. The bears made a lot of effort to conserve this much energy. While sleeping, they took only one or two breaths per minute. As they inhaled, their hearts did a quick flutter and then stopped until the next breath—resulting in a heart rate of about four beats per minute. Finally, the researchers found that during the few weeks before and after going into hibernation, the bears enter an intermediate metabolic state: wandering around and eating like normal but with lowered metabolism. Maybe little Billie Bear didn't quite understand this complicated concept -- or more likely, she simply didn't have enough body fat to get her through the long winter sleep. Either way, she -- like the Alaska bears -- got a little lucky. At the Sanctuary, she'll find food, and snug places to sleep, and spring will be here soon. As well, the folks at Aspdin Valley are used to wild animals, and understand how to work with them without socializing them to people, so there's a good chance that little Billie Bear will one day be able to go back to being what bears do best -- living in the wild, being a bear. Labels: CBC. Bear hibernation. Hibernation studies. Billie Bear. Lake of Bays. Aspdin Valley Wildlife Sanctuary. 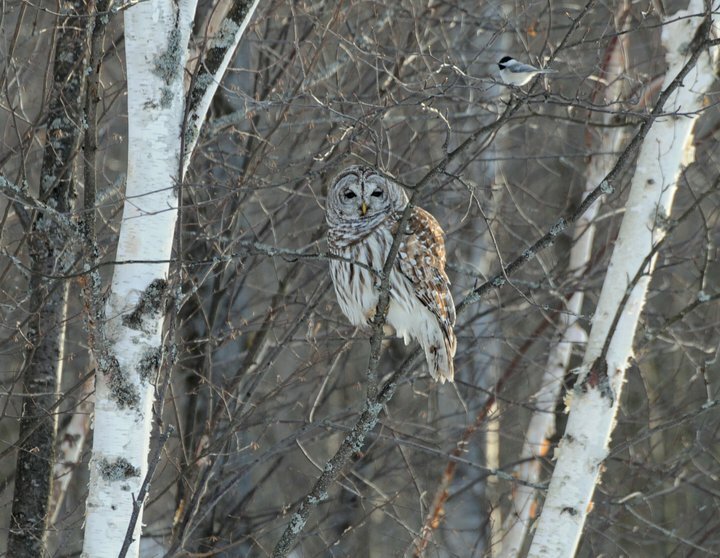 The annual Christmas Bird Count in Algonquin was extremely (and worryingly) low this year. We've been careful to keep our feeders well stocked, since it's been a bad year (from a bird's perspective) for seeds in the bush. Certain evergreens produce seeds on a cycle, and there will be hugely abundant years for seeds, followed by others, like this year, when the seed count is scant. Usually the birds simply follow the food, and move to other areas, but for birds that aren't nomadic, it's bad news and means a tough winter. So it was delightful to discover this week that in a fifteen minute period there were over 17 blue jays, and 20 chickadees at the feeders. Along with two hairy woodpeckers at my feeders, another one up at the office at the same time, and a mittful of sparrows that defied counting. They were joined by three nuthatches. Walking the puppy this morning, I found two pileated woodpeckers on the property. Not at the feeder... but drilling their way into a cedar tree. Still... they are a welcome sight. 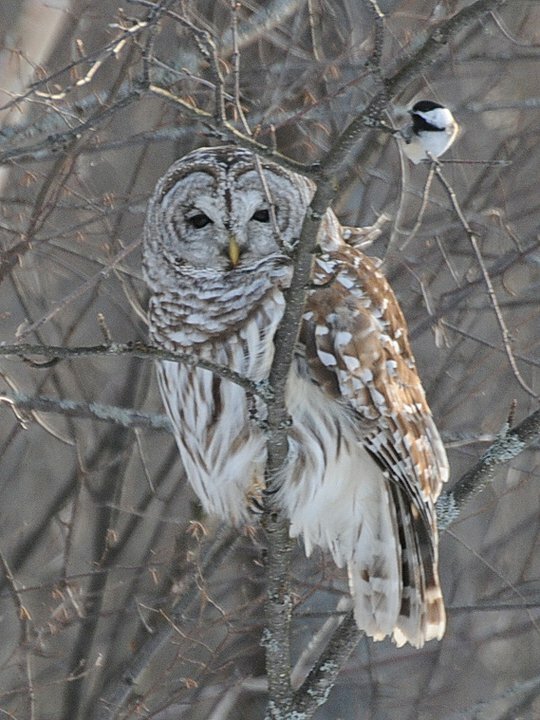 After all, not all our birds hang out at the feeding stations! Some of them are quite elusive, and rarely spotted. 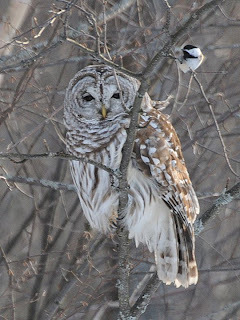 And on that note, I must thank Mike Baum, from Dorset, for sending along these spectacular photos of a bird he found in his backyard last week -- a gorgeous Barred Owl, who drifted in to sit on the clothesline near his feeder, and later relocated to a handy tree. 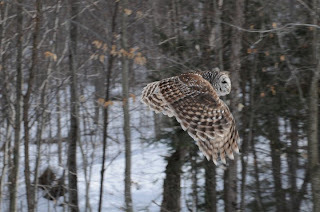 Along with the owl is one of our fearless, or foolhardy? chickadees, making this a truly special photograph. Thanks Mike! 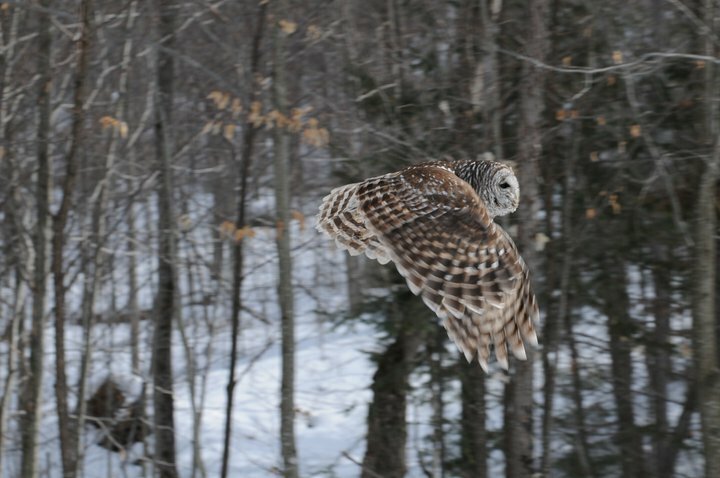 This is one of the owl species that we call every summer when we're out on the lawn after dark looking at stars. The one with the typical "Who Cooks for You?" call... Also, the only owl that has brown eyes. All the rest have golden yellow eyes. Labels: barred owl. bird count. Algonquin. Lake of Bays. Well done, the Dwight Winter Carnival! Under bright sunshine, and with mild temperatures, there was a great turnout. It kicked off with a pancake breakfast. And you have to hand it to our local MP, Tony Clement, he comes to ALL the community events. Even if it means eating food that gets cold while he's talking to his constituents! That was about the quietest it was all day. Across the road at the rink, there was curling; sled bowling (you sit on the sled, and get bowled down the rink towards big cardboard "pins" -- good fun!) and an on-going shoot-out at the net. Beyond that, the mini-snowmobiles were jam packed. And fast enough that the adults got a work-out just keeping up with the little ones! There were awards and ribbons and trophies, candy apples, candy floss and a bbq put on by the Lions' Club. There were baked goods and books, and fashionable hats for sale. Outside, Clint sported the highest fashion hat, with his creation in pure Ontario Skunk. Rock that, runway divas! The Carnival Bear found a home. Edwin West was the winner of the Bob Palmer Award for community service, and everyone cheered. The juggler got everyone into the act. It was a great day, lots of people, tons of kids, plenty to do, and wonderful weather. So now it's over, the Carnival Committee can take a deep breath, and then stand up again, for a round of applause. It takes a community to keep events like this alive. Be su re to keep this on your calendars! Our guests were there, having fun. Lyla went twice on the dog sleds, and Geza looked like an experienced hand driving the mini-sleds! And honestly, where can you have this much fun for just a $3.00 Carnival Button admission??? Labels: Dwight Winter Carnival. Family Fun. Lake of Bays. She has a loop she just adores -- down to the lake by Springside cottage, then back through the BMD Parkway trail that crosses the creek through the swamp, and loops back to the pond. This is a route that is thick with the tracks of squirrels, mice, rabbits of assorted sizes, deer, and birds. The scent must be glorious for a dog, because the puppy has her nose constantly shoved down into the snow for deep inhalations. I almost always carry a camera when I go outside now. There is always something going on. This morning, I forgot. Blame the pancakes... in my maple syrup induced haze, I left the camera in my other jacket pocket. Which was a shame, because along with all the animal tracks along the way, we found a pair of pileated woodpeckers, right at the edge of the trail, busily working on two separate holes in the same tree. We were only about 20 feet away from them, and what a photo it would have made. Could have, should have, would have... I came back, grabbed camera, and returned. Birds still there? Check. Would they stay on the tree as I approached a second time? No. These are incredible birds. I've posted about them before -- they are among my favourites, and they are quite commonly seen around Bondi. Their loud rat-a-tat can be heard from a long way off -- and if you've ever wondered why they don't fall from the trees with concussion from pounding their heads into hard wood, it's because they are magic... Or at least so incredibly well designed. Not just the feathers that act to brace them, but the bone structure, the beak itself and their phenomenal woodpecker's tongue help do the trick. This tongue actually exits the back of the skull, wraps over the cranium, and acts as a cushion -- ensuring that not only is there some shock absorption at work, but that when a woodpecker has something on his mind, more than likely, it's his tongue! Labels: pileated woodpeckers. woodpecker's tongue. Wildlife. Nature trails. Bondi Village Resort. Algonquin Park. Lake of Bays. The slush took a swipe at our big skating rink. That's the bad news. The good news is that the same mild spell watered up the rest of the lake, leaving us with many many smaller "rinks" scattered along the bay. Most of these are more than large enough to accommodate young skaters. Some have ample room for a quick game of shinny. In fact, there are so many options that the hard part is deciding just where to start. Geza and Lyla spent some time considering the options. Once Lyla had 'scouted' the area, she handed the shovel over to Geza, who set out with the perfectly sized shovel to see what they could create. After all, most of the fun is in the journey! With or without skates, the adventure of being on frozen water, making tracks, was plenty of fun. Just being in the Great Outdoors, exploring, and interacting with Nature Herself, is one of the best gifts we can ever give our children! Labels: Bondi Village Resort. Lake of Bays. Algonquin Park. outdoor skating. lake skating. 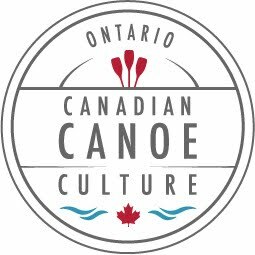 family activities in Ontario. Barb and Peter stopped to chat to Brian, who was just about to head into the bush to cut more firewood. An essential ingredient in that task is the snowmobile, and the big yellow sled it pulls, laden with chainsaws, fuel, tools of various description. By the time the pair had returned, there had been a little sea change in the order. Barb was in the driver's seat! If she keeps this up, Pete'll be getting her a helmet and a sled of her own! Makes a change from pole-walking and snowshoeing! Labels: Old Salts Canoe Club. Seniors outing groups. snowmobiles. Muskoka. Lake of Bays. Bondi Village Resort. 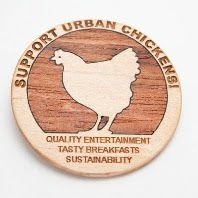 Look what you can get for just a $3 button!!! The Dwight Winter Carnival kicked off Thursday evening with the Princess Pageant... crowning teensy tiny Snowflakes; almost as teensy Princess, and the Queen of the Carnival. 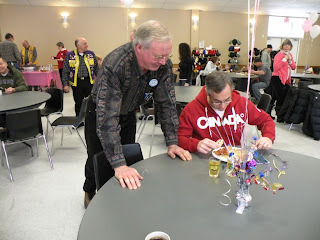 Tomorrow, pencil in the Pancake Breakfast, from 8 - 10.30, hosted by the Dwight Lions' Club; and then just hang around -- there are trophy presentations (Bob Palmer award, Fishing Trophies, the Carnival Bear) and then the real fun gets going, with Jugglers, Face Painters, the Wye Marsh Wet 'n Scaley Show, a drum circle, indoor horse races, outdoor tea making, dog sled rides, Mini Sleds snowmobiles for the little ones, bbq lunch, a pie baking contest and auction... 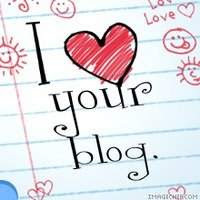 It leaes you breathless! There's plenty more, and you can find the full program at the Dwight Winter Carnival site. Come evening, the party moves indoors for an 80's Themed Dance in the Community Centre, just $5.00/person. Indoor fun, outdoor fun, lots to do, plenty to see -- oh, and did we mention Breakfast AND lunch being served? See you there. What a day! They were late arriving in Dwight, our armed forces... that's because the trails to the north were a tad, shall we say, rough. With some 20 students along for the ride, the armed forces were on manouevres via snowmobile -- or LOSV (light over snow vehicles). It's a four day exercise: from Petawawa to Mattawa to Dwight, back to Mattawa, back to Pet... That's a lot of pounding along the trails. Particularly along trails that would benefit from a good fall of snow. While the hoped for arrival in Dwight was to have been about 2 p.m., they didn't roll in until close to 7 p.m. And then they spent a lot of time repairing the skis on the snowmobiles, replacing the runner bars, refueling and other running repairs. Because they were late, and had a lot of repairs to do, the Township opened up the Community Centre for the group, and they were truly grateful to be able to avoid setting up tents in the snow for the night. The Canadian Armed Forces will be at the Dwight Municipal Offices today, on manoeuvres with snowmobiles. Not that they are called snowmobiles. The Dept. of Defence never uses one word where more will suffice, so they are termed Light Over Snow Vehicles. (as opposed, one must think, to Heavy Under Snow vehicles... which are more commonly termed Car Stuck in Ditch, but I digress) Then, having strung out the words, the army shortens them: LOSV. The military will be setting up an overnight camp, and the public is welcome to visit them, from 2 p.m. onward, to chat and see the equipment. And, I might add, to say "Thank You." These boys and girls do just a phenomenal job for our country, for all of us. So drop on over, and check out the LOSV's, and the fine people who drive 'em! This is the machine that keeps the snowmobile trails in great shape. 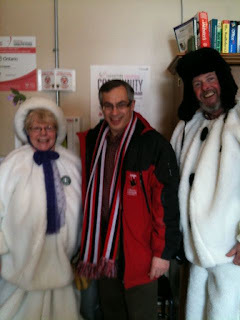 It was on dispay at the Dorset Snowball Carnival on Saturday (as was Tony Clement...) (on display that is, strolling main street, with Mr. and Mrs. Snowball) I suspect that Tony never misses a Carnival in this riding... and who could blame him? They are just plain good fun. There was action everywhere, despite the cold wind. Kids on the kiddy-carts mini-snowmobiles who didn't seem to mind the cold; karoake singers who didn't seem to mind the off-key notes; jugglers; wildlife callers who nailed every call; displays of maple syrup, and pioneer tools -- and then you could move inside for minnow races and soapstone carving and, of course, chili. What winter carnival could be complete without chili? You could also hitch a ride along the street, behind this great team of Belgians. Or, at the other end of town, watch the snowmobiles congregate on the bay. Plenty of folk were out to enjoy the day. Next weekend, it's the Dwight Winter Carnival -- with plenty of action and fun (and dog sleds!) so if you missed out on Dorset, you can still come north and catch the Carnival spirit! Labels: Dorset Winter Carnival. Muskoka. Bondi Village. Vic has made the comment that we seem to go through hay faster than anyone he knows, given the number of horses we've got this winter. That would be because as soon as the horses move out of the paddock with the round bale, the deer move in. They nibble. They curl up and nap in the loose hay. They nibble some more. This pair greeted me this morning as I opened up the barn to let the horses out. They were enjoying breakfast! Labels: whitetail deer. wildlife watching. Bondi Village Resort. Fishing. It's all location, location, location. And according to Mike and Dave, the current location was less than optimal. Following the mild spell on Thursday, the lakes watered up, which helped freeze down most of the slush. That afforded the B.M.D. (Bondi Maintenance Dept., Local 4) the opportunity to relocate the fish hut. While the view was great and the minnows were lively, the response from the fish was less than enthusiastic. Dave and Mike sussed out a deeper location, and prepared to up-stakes and leave town. First, it is necessary to chop and pry the fish-hut free from the ice. For this, the puppy is helpful but not absolutely necessary. Then the official Rossignol skis are installed on the skids -- a refinement developed in the top secret BMD R&D labs, using skis found at the local dump. Once everything was ready to go, all that was needed was a little muscle power, and the hut willingly slid off down the lake to its new location, in twice as much water. It occured to us that if they had just cut a shallow trench through the ice along their intended line of travel, they could have left the lines in, and trolled. Which might have given them better luck than they've had so far. But then, it's not really about the catch, it's about the chase, and they've had a great time designing, refining and enjoying the hut, with or without fish. You need deep water this time of year. Over on Dwight Bay, the fishermen are having good luck, but that bay is fed by two rivers that converge in front of the main dock area, and are popular with the fish. Our cousin, Ross Tapley, at Logging Chain Lodge, is renting huts this year, for $75/day, and several of our guests are staying with us, where they can also enjoy ski trails, toboggan hills, and all our other facilities, while the "manly men" head over for a day in the hut at Dwight. it seems to work out for everyone. Labels: fish huts rentals. Lake of Bays. Bondi Village. Our relationship with snowshoes goes back about as far as the time the first people ran into the first snowdrift. While in Scandinavia, the snowshoe gradually evolved into the nordic ski, over here, the snowshoe reigned pretty much supreme -- at least until the skis were embraced for recreational purposes as well as for simple transportation. 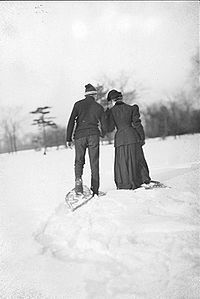 While the Innuit have (it is said) some 27 words for snow, each American Indian tribe had its own particular shape of snowshoe. In the far north, where there is frequently less snow depth than you might think, because much of the travel is over sea ice, which is wind scoured and hard packed, and so easier to cross than the deep, fluffy snow of the Iroquois Indian's woodlands, there were two main designs -- one triangular, and about 18 inches long, the other almost circular. Southward the shoe becomes gradually narrower and longer, the largest being the hunting snow-shoe of the Cree -- nearly 6 ft (1.8 m) long and turned up at the toe. Even smaller models, such as those of the Iroquois, were narrower and shorter, reflecting travel in heavily forested areas where wetter and shallower snow cover during winter made flotation less important, but put a premium on maneuverability. Even the Plains Indians embraced snowshoes during their winter buffalo hunts -- until the shoes were replaced by horses. Who had their own history of wearing snowshoes, while working in the logging camps. Over the years, the snowshoe has evolved, into a sleeker, lighter, nimbler version. Modern shoes incorporate a 'bear claw' device to prevent slipping, and some, for climbing hills, add an elevated heel bar to ease leg strain. Clothing has improved as well -- no need to emulate this couple photographed in 1907, enjoying an afternoon stroll! All of which means there's no good excuse for not strapping on a pair, and heading outdoors. Which is precisely what our guests at the Lodge this weekend have in mind, with their almost complete collection of snowshoe styles on display by the door! Labels: snowshoe. Bondi Village. Winter sports. Little Bear, you should be Sleeping! I Wanna Driva a Zamboni! SLEDFEST and great times on trails. Fishing? Yes. Catching? That Too. How Much Wood could a Wood Chuck Chuck?